As part of this cycle I have been talking with some people in the awesome Ubuntu LoCo Teams community to identify next steps in how we can optimize the community to go out and get 200 million users. Today I feel we have a fantastic LoCo Team community; lots of teams distributed throughout the world, governance effectively applied via the LoCo Council, and continued excitement and growth in our various events. provide a central point in which you can find out about all the incredible work going on in the community. encourage best practice and skills acquisition across different LoCo teams. encourage and inspire teams to participate by seeing the great work and ideas from other teams. Randall Ross – I was really impressed with the work Randall has done with the Vancouver team and I am keen to see how he can help teams share and flow best practice and ideas between them. Laura Czajkowski – Laura has done great work with the LoCo Council in continuing to govern and promote quality, fair, and balanced interaction between teams. Michael Hall, Chris Johnston, and Nigel Babu – these guys all contribute to the awesome loco.ubuntu.com, among many other great contributors. 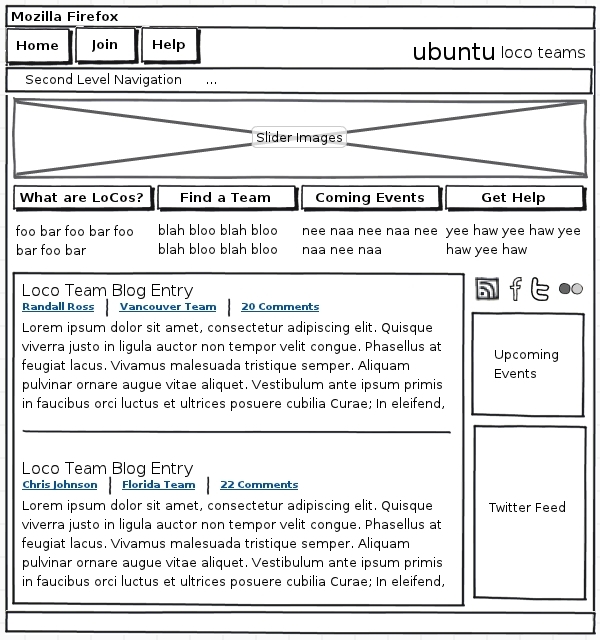 Make loco.ubuntu.com more tab-worthy; in other words, add value to loco.ubuntu.com that will provide the central point for finding out what the community are working on, as discussed above, thus opening the doors for (a) teams to share their great work in a hub for LoCo activity and (b) for teams to be inspired by the work of other teams, thus encouraging future contributions. We will build upon this work to make loco.ubuntu.com a real hub of activity and a central point for LoCo members and teams to congregate. The goal here is a rolling stream of content that justifies a tab in your browser open all day showing this content. We will work with community leaders to encourage wider posting and sharing of updates and progress achieved by teams, and also encourage the publication of best practice and ideas to inspire other teams to participate in their area. In a nutshell: by building a hub of information and knowledge, and then reaching out to community leaders to provide useful and interesting content, we expect this will grow knowledge, skills, and inspiration in teams to be successful in their own projects. showing the people-orientated nature of LoCo teams via a slider that shows different photos from events. This could also be used to add informational slider images highlighting campaigns such as the Ubuntu Global Jam. provide a regularly updating stream of blog content from across the LoCo community. showcase other dynamic content from Twitter and social networking sites. provide a set of quick-start links for brand new users to get started. The slider would function like the one on uds.ubuntu.com and the images at first would be chosen by the admins of the site and/or the LoCo Council. Under the slider are quick start points for brand new users, again inspired by similar buttons on cloud.ubuntu.com. It would be useful to have a close button in the top-right corner of this section for regular users who no longer want to see these buttons when they visit the site. The blogging area would be regularly updated and function a bit like the Ubuntu Planet. On the call we discussed that the choice of feeds would at first be recommended by the LoCo Council and the site admins and we would ask people to provide RSS feeds for tagged entries (e.g. so if I tag a blog entry on my blog with ubuntu-loco it would appear on the site). Randall and I committed to recommending the first 25 feeds to appear on the site. For each feed we would also note the team that the person is in, so we can provide this meta-data under the post title to show the different teams that have content posted on the site. Again, this is very much a first cut of the design, and comments are welcome; the goal here is to outline and share the discussions so far. I am delighted with everyone on board to make these changes, and I think this will really help us grow and inspire the global Ubuntu community. I really don’t get it. How will you get up to 200 million users with only community support? Should I bother my family and all my friends to change from Windows/Mac to Ubuntu? That didn’t work in the past and will not work in future. The only think that could work to get a wider user base (I don’t believe 200 million users are realistic) is to make deals with hardware companies. Ubuntu computers should be available worldwide in every little computer store/corner. And they have to be cheaper than the existing Windows computers. Not to forget the hardware compatibility with printer, scanner, webcam and all the other stuff out there. I absolutely agree Randall, many people’s effort and step by step, then gain today Ubuntu’s success, and i think the great community is most important. Great initial design. Looking forward to making this site rock!